Recently sold a rear fold camper due to frustrating under bed storage area accessibility and setup campsite footprint being too long, the rear fold campers are basically a roof top tent anyways. ... but, I guess rego requirements do vary a bit. In NSW if the trailer is greater than 250kgs unladen or 750kgs laden, then it needs annual inspections. High sides on the box trailer will be your friend, and no need to go over board with all the fancy suspension that all the factory campers have, ever seen a boat trailer with fancy set up? solid leaf springs will do just fine. Yep did 11,000 kms on the last camper thru VIC, SA, NT and WA on good old leaf springs , on road and offroad, will upgrade the hitch to a treg style. No such thing as a trailer inspection in Vic no matter what gvm, I'm looking max 750 gvm anyway, have a Ute to carry excess gear. I just looked into building a car trailer cheaper to buy one. Why don't u just book up a off road camper trailer and save all the hassle. What about suspension? How did you achieve that special articulated suspension on leaf springs ? Was considering a forward fold after owning the rear fold, like the off ground seating area but they seem to be very heavy with a high towball weight and have extras I just dont need. On my last 6 week trip we didn't use pull out "kitchen" except for cooking on gas burner sometimes, sink never used, underfloor water tank full but never used, kept a 50 lt water drum full and topped up as needed for washing up and drinking. Don't need fridge slide, got one in the Ute, found it great to have fridge in Ute rather than on camper, wherever you drive outside campsite sightseeing or whatever, the food and cold drinks are always with you. 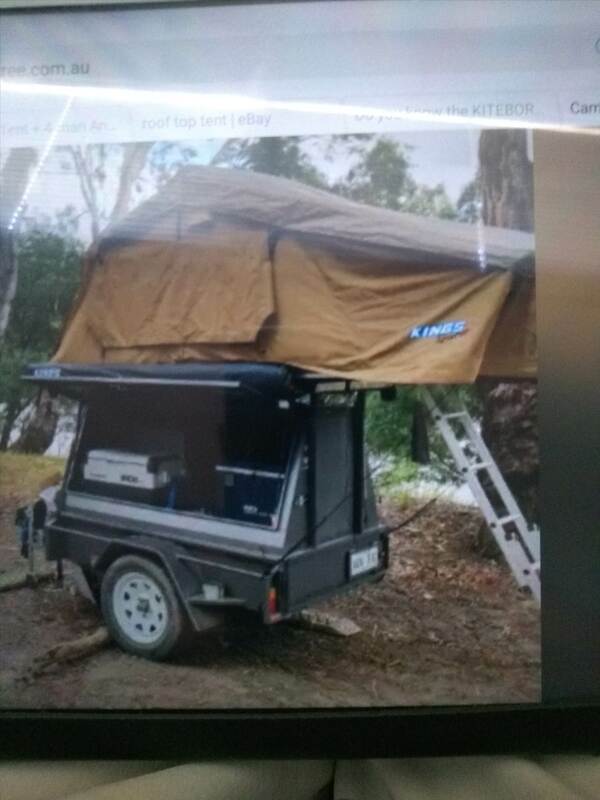 I can do what I plan to do for about $3500, trailer $950, might go for the kings hardshell rtt at just over $1000 for super fast setup, add a couple of kings awnings $200 ( got a fair bit of kings kit and happy with it ) add agm battery, a couple of outlets and some leds around $400 have a bit of an electrical/tech background so 12v systems a breeze. I already have solar panels, Weber baby q, gas two burner camp cooker, etc. Might lash out and get a gas hot water system for showers they have come down in price to about $250 will add a water tank and pump if I do, bit of a luxury but handy for free camping. Forward fold nice but I don't need it. That ladder could be problematic after a few bevies !